Can you feed your family on $75 a week? First of all, I need to make a disclaimer. I’m going to talk about a book I’m reading. No one asked me to review this book. I did not get this book for free. Well, I sort of did in that I checked it out from the library. And then renewed it. But it won’t end up being entirely free because I will likely have a fine for returning it late. Because we all know how I now avoid the library. Of course my library may excuse any fine, just to keep us from gracing their presence. Anyhoo. How I’ve digressed. 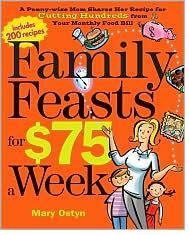 A while back, I found out that Mary Ostyn of Owlhaven wrote a book called “Family Feasts for $75 a Week”. The title alone spoke to my frugal heart. Mary has a family of 10 and is well known for her creative frugal means of keeping her family well fed and alive. And I heart her. She has been one of my most favorite bloggers since I started this blogging journey in 2006. And no, she has no idea I’m writing this. I also love her new book. I’m attempting to get away from buying a lot of pre-packaged food, and make as much from scratch as possible. The reason is that it’s cheaper and healthier. This morning I made pancakes from a homemade pancake mix recipe in Mary’s book. She has a recipe for a healthier Bisquick type pancake mix. Once you put all the dry ingredients together, you can store it for up to a year. And making the actual pancakes is as simple as adding warm water, eggs, and vanilla. The kids devoured them. I’ve been trying out a bunch of the recipes over the last two weeks and have all been wonderful AND EASY. Big frugal thumbs up on this book. Good job, my friend. 10 Responses to Can you feed your family on $75 a week? OOooo! I entered my chicken-n-dumplin recipe. Cheap, but you’d never know it. thanks for the review, I glanced at it but didn’t have time to look further. 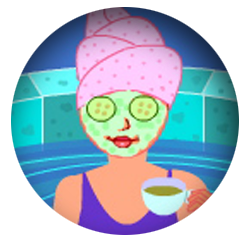 I have a few great blogs listed on my sidebar about savings, you should check them out, those ladies are awesome! I used to spend under $100/week at walmart. That included diapers, tampons, soaps and food for a family of six for a week! The library! Duh!!! Why didn’t I think of that! I’ve got to find a way to spend less on my Wally World trips! Its been one of my new years resolutions to spend less on groceries per week…this book looks like it’d be a great way to get started! Awesome, I will check it out! Also, I just saw a link to this on a friend’s blog and thought of you. Awesome, I will have to look that one up! I bought this book and love it! My favourite is the homemake terryaki sauce! Great book!